This is a variation on pasta e fagioli (a side note: unless you are Frank Sinatra, the dish is not called pasta e fasul) and can also be called zuppa di ceci, or, in Sicily, ciciri ca pasta. 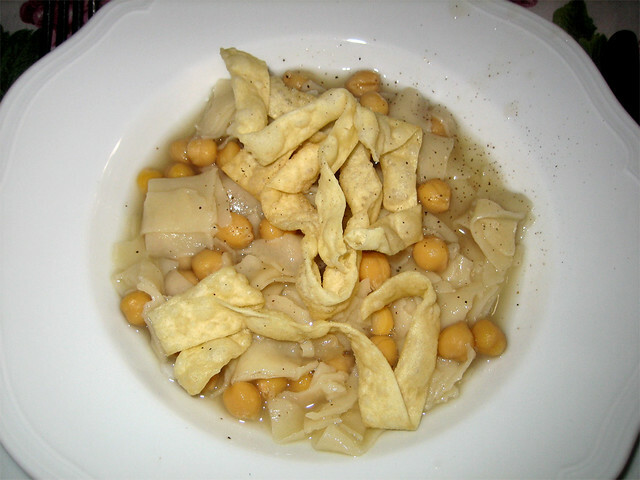 One of the most common ways to serve chickpeas, pasta e ceci varies in its preparation from region to region - and even from cook to cook - and can have either a broth base flavored with tomato, rosemary, and chili pepper or a thicker base made by blending a portion of the cooked chickpeas before adding the pasta. In Rome and southern Italy, short dried pasta like ditalini are used. Further north, small squares of fresh egg pasta like quadrucci or maltagliati are more common. Either way, this is a deeply satisfying bowl of comfort on a cold day. This chickpea flour pancake or flatbread is one of those dishes that, when it's good, is very, very good. And when it's bad, it's a dry, tasteless mess. 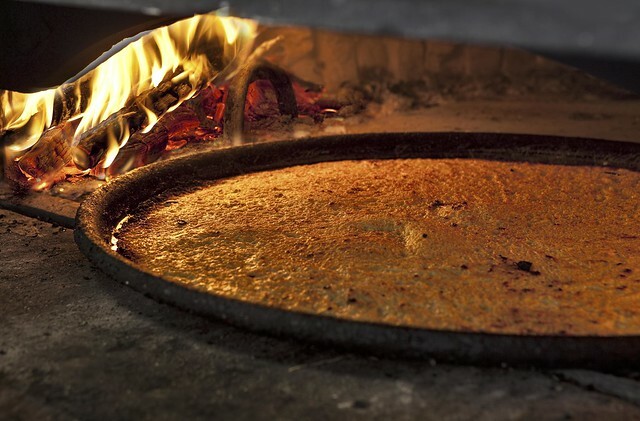 Found most commonly in Liguria, parts of Tuscany (where it's known as cecina), and Piedmont, farinata is a street food snack made from a simple batter of chickpea flour, water, salt, olive oil and baked in a copper pan in a wood-burning oven, usually in storefront establishment that also sells pizza by the slice. Cut into irregular wedges and served with a sprinkling of black pepper and rosemary, a good farinata is crispy on the outside and slightly creamy or custardy on the inside and best eaten hot from the oven. 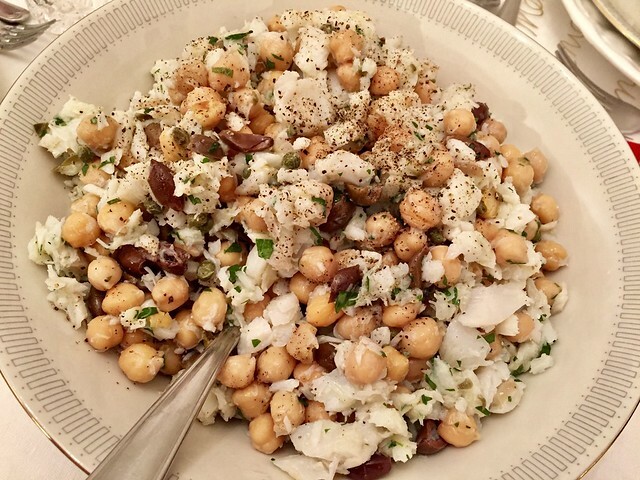 One of the most surprising pairings you'll find in Italy is chickpeas with fish, specifically dried and salted cod, in this rustic dish traditionally served on Christmas Eve. Baccalà, or salt cod, was once one of the most common types of fish eaten in Italy, as it was easy to transport to the countryside far from the coast and could be stored safely for months. It is enjoying a comeback among modern chefs, who appreciate its unique flavor and texture, and now you can find baccalà and ceci, a simple tomato-based stew of chickpeas and salt cod, on traditional menus from Tuscany to Naples. A close cousin to farinata both in its Genovese origins and popularity as a street food, panissa is made by cooking chickpea flour into a polenta-like paste then cooling it until it solidifies enough to be cut into bite-sized strips or cubes and deep-fried in olive oil. Served hot in cones from street vendors, panissa has a crisp fried outer coating and a smooth, creamy inside. Sicily's unique island cuisine reflects the influence of centuries spent under Arab rule during the Middle Ages, and panelle, or chickpea fritters, are thought to be one of the many dishes introduced from the Middle East. 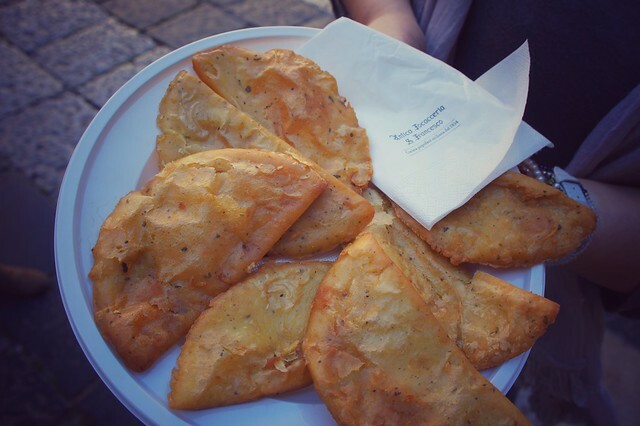 One of the most popular street foods in Palermo, this simple fritter of chickpea flour, water, and parsley is sold by street vendors or friggitorie (fried food stands), served like a sandwich on a local sesame seed bun called a malfada. Sicily wasn't the only corner of Italy influenced by the cuisine and culture of its Arab conquerers. 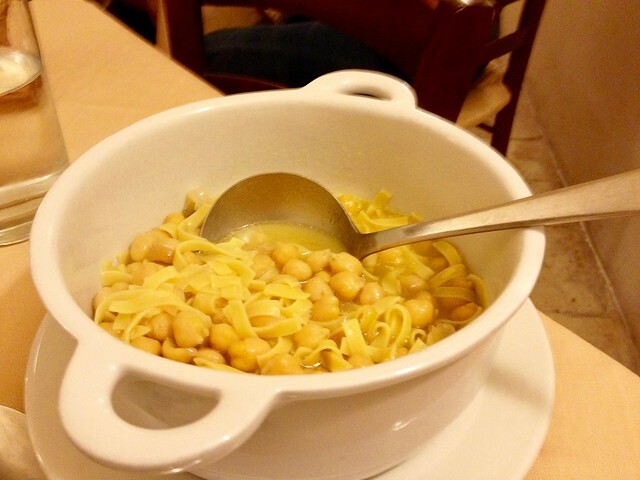 The Salento peninsula also has hints of the Middle East in many of its traditional dishes, including ciceri e tria, or chickpeas and pasta, from the Latin word for chickpeas and the Arab word for noodle. This dish is made with fresh pasta tossed with a bit of bay-infused broth, cooked chickpeas, and crispy fried noodles called fruzzuli. The dish is also known as Massa di San Giuseppe because it was traditionally served on the 19th of March, both the Feast day of Saint Joseph and Father's Day in Italy, though today you can sample it year round. These traditional crescent-shaped Christmas cookies from Abruzzo are made with a sweet pastry dough stuffed with a chickpea and chocolate filling, then deep fried and sprinkled with powdered sugar. 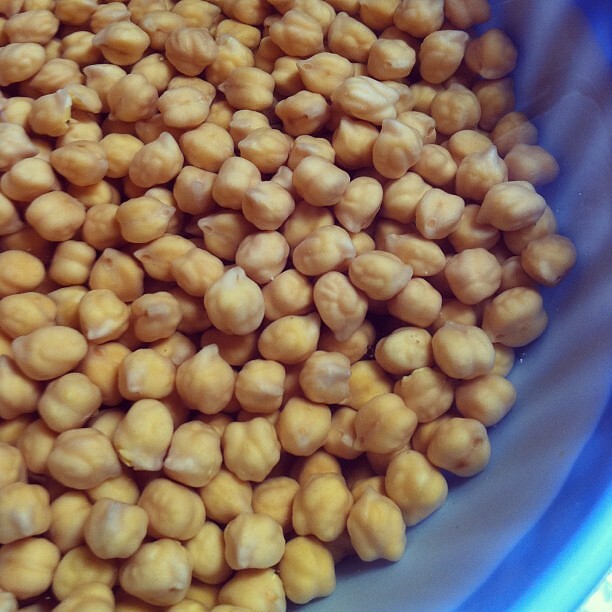 Chickpeas have a rich texture and nutty flavor similar to chestnuts, so were a handy substitute in this historically poor region of Italy where chestnuts were harder to come by. Calcionelli, also known as calzoncelli, calcionetti, or canciuni can also be stuffed with a honey and nut filling or jam, but the traditional ceci e cioccolato is the most historic.